Shoulder impingement is a common condition characterized by sharp pain in the top of the shoulder when reaching or lifting your arm overhead. Often there is also pain when reaching behind the back. This pain is due to rotator cuff tendons becoming compressed or pinched as they run through the shoulder joint. 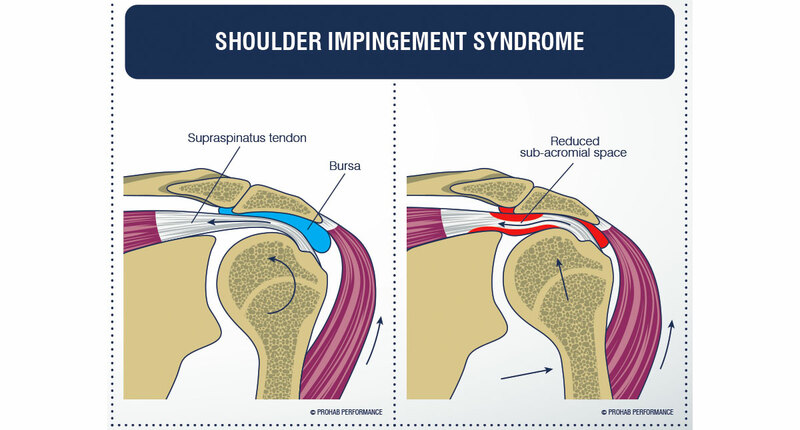 If not treated, shoulder impingement can increase in severity and become very disabling. Shoulder impingement can be caused by a variety of factors. The primary way that the tendons become compressed is when the space in the joint where the tendons run is reduced. This can be due to the development of bone spurs inside the joint space or when the top of the humerus bone is no longer aligned perfectly in the shoulder joint. Shoulder stiffness and decreased flexibility can make it difficult for the humerus to glide in the joint and decrease the space where the rotator cuff tendons run. Muscle weakness can also lead to shoulder impingement. The rotator cuff muscles function to hold the humerus in correct alignment in the joint as the arm is raised and if they become weak or atrophied, this alignment can be lost. Injuries to the rotator cuff muscles or tears in the tendon can also lead to muscle weakness so these two conditions are commonly found together. Weakness of the shoulder blade muscles can also cause impingement when weak muscles fail to hold the shoulder blades in correct position during overhead movement. Shoulder impingement can be successfully managed with non-surgical treatment including physical therapy. If untreated, impingement can develop into bursitis, where the tissues in the shoulder joint become irritated and inflamed. If impingement is caused by friction between bone spurs and the rotator cuff tendons, repetitive motion can damage the rotator cuff tendons which can require surgical interventions. Surgical interventions for shoulder impingement include arthroscopic procedures to increase space in the shoulder joint including smoothing bone spurs and partially removing sections of the joint to increase space. Damaged rotator cuff tendons can also be repaired allowing for improved muscle function during overhead motion. Sharp pain in the top of the shoulder with overhead movement or aching in the shoulder when laying on the shoulder at night should be evaluated by an orthopaedic specialist who will identify the cause of the problem and differentiate between impingement, rotator cuff injury, frozen shoulder and other disorders of the shoulder. Early identification is key to successful treatment and the prevention of surgical intervention.